ironic frame + plastic bag + carton,They have special packaging (minimize shipping damage and missing parts), every set is tested at the factory. 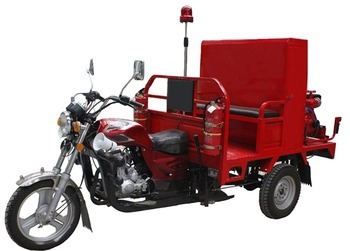 Motor Fire truck, three-wheel motorcycle chassis and gasoline engine, small size and multi-function .Equipped by the 300 Liters water tanks, water pumps, tools boxes, warning lights, horn, speaker, widely used in urban and countryside street fire, road cleaning , garden or farm irrigation, water spraying, etc.. The water pump is powerful. 4.4 KW power can lift 60 meters height to fighting fire. It can connect with fire hydrant, also it can sucking water from pool or lake. This vehicle is flexible, fast and convenient to use, suitable for all kinds of roads. It can quickly reach to the fire scene; start the fire fighting at once. Make sure control the spread of the fire source, to achieve the purpose of extinguishment. This is ideal for fire-fighting equipment. We have the capability of producing 500,000 sets of LUOJIA brand motorcycles from 48cc to 250cc annually. And we have got great fame for our brand. For example, our brand LUOJIA is the top brand in many markets, such as Togo and Myanmar (Burma), one country in West Africa, and another in Southeast Asia.